It’s been a while since my last post. Excuse: thesis write-up. Update: Thesis submitted! 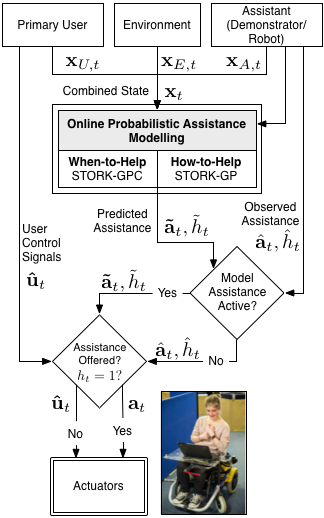 In other news, our recent work on Learning Assistance by Demonstration was accepted this year’s IROS! It’ll be a fun and interesting conference in Tokyo, Japan! You can find a preprint here. Abstract: Crafting a proper assistance policy is a difficult endeavour but essential for the development of robotic assistants. Indeed, assistance is a complex issue that depends not only on the task-at-hand, but also on the state of the user, environment and competing objectives. As a way forward, this paper proposes learning the task of assistance through observation; an approach we term Learning Assistance by Demonstration (LAD). Our methodology is a subclass of Learning-by-Demonstration (LbD), yet directly addresses difficult issues associated with proper assistance such as when and how to appropriately assist. To learn assistive policies, we develop a probabilistic model that explicitly captures these elements and provide efficient, online, training methods. Experimental results on smart mobility assistance — using both simulation and a real-world smart wheelchair platform — demonstrate the effectiveness of our approach; the LAD model quickly learns when to assist (achieving an AUC score of 0.95 after only one demonstration) and improves with additional examples. Results show that this translates into better task-performance; our LAD-enabled smart wheelchair improved participant driving performance (measured in lap seconds) by 20.6s (a speedup of 137%), after a single teacher demonstration. Next Next post: First Day at SMART.